Kalimpong, Mukesh Sharma: The Biswakarma (Kami) Community have thanks CM Mamta Banerjee for announcing Development and Cultural board for the community .The Biswakarma Youth Association which was for heading the demand of Biswakarma ( Kami ) development board organised a rally and held a prgram thanking CM Mamata Banerjee who two weeks ago declared a separate board for Kami Community. 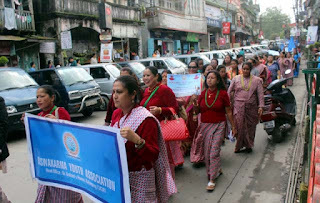 The Association took a rally from town hall premises in which hundreds of community member with thanks giving board in their hand. The rally after encircling the town area changed into a program at Town Hall.JAP president Dr Harka Bahadur Chhetri was present as the Chief Guest of the program. Dipesh Singh Ghatani the secretary of the association addressing the meet thanked the CM Banerjee and Dr Chhetri who during his MLA tenure after resignation from GJM spearheaded the demand in higher level. Ghatani told we have not seen this board only for our community development but with the Existence and identity as state as now recognize as ‘Bhumi putra’ of this area. Today a booklet on Development Board Vision document was released. Meanwhile Dr Chhetri addressing the meet told that the State is keen to raise power of the board in the Hills. He said beside power of Home construction, preservation of language, rites and including the development of the culture the state government is thinking of to provide more capacity to these development boards. He suggested the association to uplift the down trodden Kami community through the board.